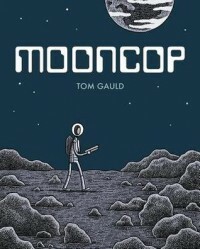 I picked up Mooncop because I'd previously read Baking with Kafka, a collection of comics mainly about books. Mooncop is very different but also not. It is one long story about a police officer who is running out of work (but keeps a 100% solving rate of all non-existing crime) on a dwindling moon colony. It's the futility of his work really. It's sad but in a beautiful way, and I enjoyed it way more than I thought I would. The drawings are simple and much like the short comics, and they tell the story in the right way.